I was surprised by the beautiful sunset in Sagittarius – bright reflecting in the sky soft pink tones over the clouds while the Moon was rising glamorously beautiful. The Sun and the Moon between clouds were saying “Life is a sleep, love is the dream you have lived if you liked”. Alfred de Musset – French Poet who became one of the first Romantic writers and was born with under the Sun in Sagittarius and the Moon in Gemini on 11DEC1810 @11:00am in Paris. 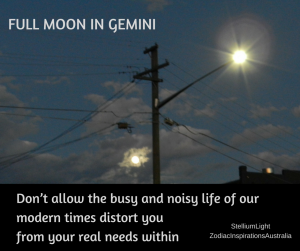 Please note the photo I have chosen for tonight is over the 2 houses reflecting the duality that Gemini’s sign represents and also it shows the power lines of communication that is the energy that this Airy Moon emanates to express emotions! 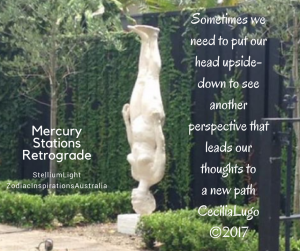 Both Luminaries (Sun and Moon) are challenged by Mystic Neptune inviting us to contemplate… to be able to listen to our own truth. See the picture of the (almost full) moon as it illuminates the sky at the same size as the street light… the image says to me – Don’t allow the busy and noisy life of our modern times distort you from your real needs inside of yourself. “A traveller without observation is a bird without wings.” ―Moslih Eddin Saadi also is known as Saadi of Shiraz― was a major Persian poet and literary of the medieval period. We may feel that the world is upside down or each of us is having our head upside-down… But don’t lose your smile. Keep trying every day to achieve something that you consider aligns with your beliefs. In spite of any obstacle that may stand in your way… No matter how hard or difficult the road may be, it does not matter what stones you may find, or the people who want to abandon your boat…continue positive.